The Oregon Walk+Roll Challenge is a friendly month-long competition—held annually each May—aimed at encouraging more kids and families to walk, bike and roll to and from school. In Oregon, the Walk+Roll Challenge is hosted by The Street Trust (formerly the Bicycle Transportation Alliance). 1. 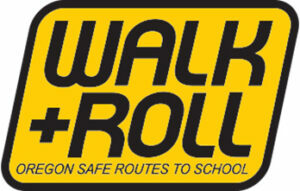 Register your school for the Walk+Roll Challenge Month. 3. Get tips and resources for organizing and promoting the event. 4. Throughout the month, track your school’s activity, take pictures of your events, and write down any fun stories or quotes from your event. The Street Trust will host a raffle with cool prizes that schools can win. Up to two entries can be gained by schools by submitting tracking activity and pictures/stories from their events. Visit The Street Trust for tons more information and inspiration! Or click here for ways to get your kid walking and biking!